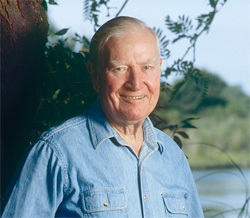 Russell E. Train, one of the most influential and well-known leaders in American conservation, passed away on Monday, Sept. 17, 2012. Over the past half century, under Train's guidance and visionary leadership, World Wildlife Fund-US has grown from a small grant-making organization into a global conservation force with over 1 million members in the U.S. Train was a pioneer not only at WWF, but for the entire conservation movement in this country and around the world. We honor him by continuing our work to protect the world’s most ecologically important regions, and by ensuring that the Education For Nature Program created in his name continues to train and support the next generation of conservation leaders. View tributes in honor and remembrance of Russell E. Train from people around the world whose lives have been impacted by him and his work in conservation. We invite you to contribute and share your own thoughts too. *The Education for Nature Program is partially funded by a dedicated endowment to support the long-term viability of Russell E. Train’s legacy, and through additional contributions and support.